Will Hurricane Irene crash into Governors Island this weekend? 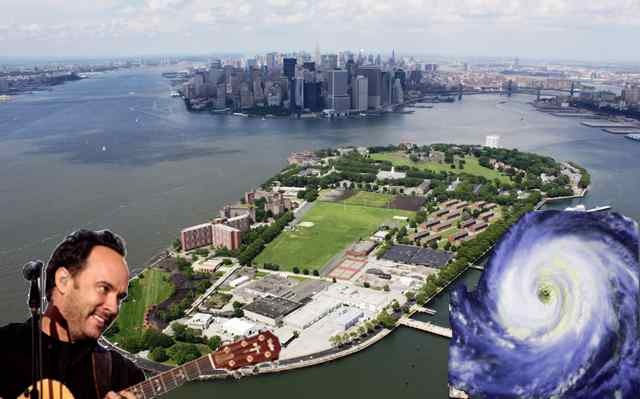 Despite there being a death toll from storms colliding with music festivals this summer, the Dave Matthews Band Caravan is still planning on setting up shop on Governors Island all weekend. The three-day festival, which some people are paying $825 to attend, starts tomorrow and runs through Sunday night. Governors Island just Tweeted this morning: "Currently all DMB Caravan concerts are scheduled to go on as planned." They also noted there will be updates on the website if there are any changes. But how sick would it be to hear "Crash Into Me" live while in the eye of the storm, brah? Chewy, you have to take care of the Princess now. Man, if we had a nickel for every time we watched Han Solo get encased in carbonite in The Empire Strikes Back and said the words "damn, that'd make a great ice cube!" Too bad. ThinkGeek, in their infinite wisdom, has beaten us to the idea. Their geekery has spawned the Star Wars Han Solo in Carbonite Ice Tray, which, as you might have guessed, holds seven Han Solo ice cubes. Poor Chewy. Don't worry, it's not permanent! He'll be out soon, and ThinkGeek appropriately mentions: "The empire will compensate you if he melts." i.imgur.com — This is Epic!